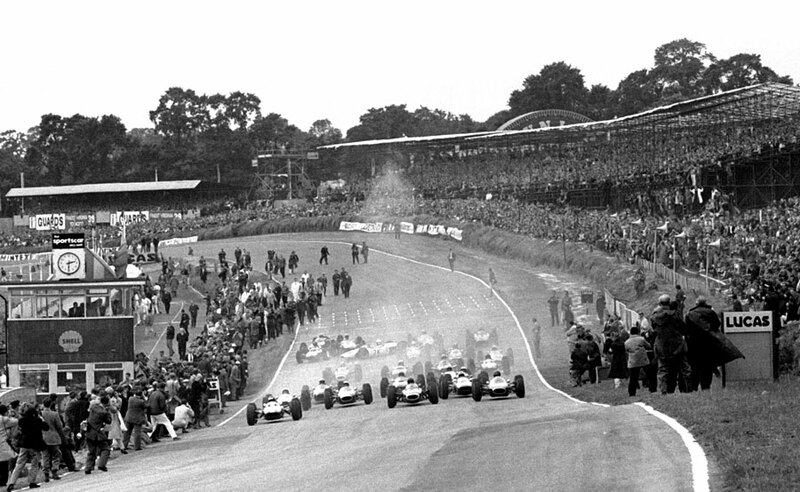 For the first time, the British Grand Prix was held at Brands Hatch in Kent, which, according to race winner Jim Clark was "almost as difficult as Monaco, you are changing gear at least 20 times a lap and straining the suspension all the time". This didn't appear to cause him problems, as he came home victorious after a fantastic battle with championship rival Graham Hill, finishing less than three seconds ahead. In the first practice session, Trevor Taylor had a very lucky escape when his foot became caught under the brake pedal of his Lotus BRM. He was heading up to the corner at the top of Hawthorn Hill doing 120 mph at the time, and the car flew over the six foot banking, ripping down telephone cables as it went. Taylor was thrown clear and escaped with a grazed back, although the car was badly damaged. He did start the race, but retired after 23 laps due to the cockpit heat and the pain in his back. Before a crowd of over 100,000, Clark lined up in pole position with Hill and Dan Gurney alongside him, and took an early lead. On the third lap, having already broken the lap record, Gurney stormed into the pits with ignition problems and was never in the hunt after that. John Surtees moved into third, and put all his efforts into trying to catch Hill and Clark. On lap 10, Hill began to close on Clark and the two leaders raced barely feet apart, less than a second between them. The two Ferraris of Surtees and Lorenzo Bandini were settled in third and fourth, until Jack Brabham, despite a spin and a pit stop, whipped through on the inside of Bandini on the 66th lap. It seemed inevitable that Hill would eventually pass Clark, but, just when it was needed, Clark pulled out some extra power from the Lotus and kept him at bay. Hill never gave up, and they fought right to the finish, enthralling the capacity crowd. With this victory Clark kept his advantage over Hill in the championship, leading by 30 points to 26.